I thought long and hard about what my first proper post should be. There are lots of ideas and thoughts I want to share with you. I have spent so many hours in the last 6 months drooling over such pretty and artistic pictures in beauty blogs with very articulate and informative copy to accompany them. A lot to live up to…. So before I kick off I thought I would set the scene for you with what to expect if you drop by my little corner of the internet. I’m not an expert photographer or writer. I’m certainly not an expert in the field of beauty knowledge or application, far from it. I am however in love with all things beauty. I daydream of long leisurely shopping trips with lunch in Covent Garden and popping into Chanel and Burberry although the reality is more Boots and The Body Shop in the high street on a rushed Saturday in between the housework and food shopping. Whatever end of the spectrum you may find yourself at, the feeling of leaving the store with your bag of new, shinny, shimmery, glossy and pretty packages of make up is the same for us all FAN-BLOODY-TASTIC! That’s why I’m here and I’m guessing that’s why you are too. Anyway, context now set of what to expect, back to the topic at hand today which is eyeliner. I have always struggled with its application and wonder if I was absent from school the day this lesson was taught. I have dabbled in the past and can add a slick in the waterline on occasion but the tight line or much lusted after winged effect still remains allusive to me. Now some of you may say that at my age I should just bow out gracefully and admit defeat but a quitter I am not. It’s almost become a fixation in the last couple of months – studying friends techniques, reading blogs and watching numerous You Tube tutorials. I discovered a great tip (courtesy of Pixiwoo) to line both water and tight line by inserting the pencil, closing your eye and effortlessly running it back and forth. I thought I had found my Eureka moment but after giving it a go I looked like “a monster” according to my chuckling 8 year old and inside I felt like I had regressed back to the embarrassed 14 year old girl who could not apply her eyeliner. 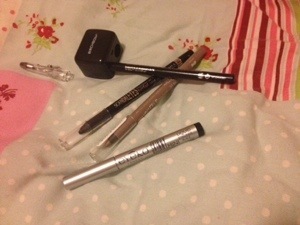 About to call it a day my January Birchbox arrived and in it an Eyeko pen liner. Was it a sign I thought to myself? I have always shied away from the liquid and gel liners feeling that I could not upgrade until I had perfected the kohl liner but had I been making my life unnecessarily hard I wondered? The nib is very fine but application seems easy if you have the time to take it slow and build up your line. The colour and staying power are also impressive. On my first attempt I did not look like a Monster although I don’t think I will be challenging Brigitte Bardot either. I will let you know how I get on and will post a picture should I ever perfect my winged line. Please feel free to comment below with any tips and tricks or if you too struggle like me. « Too late to discover beauty …?